於世界各地舞台立下多数演出金字塔的亚洲天团，在这个夏天，将会於日本踏出崭新歷史的第一步。 在成军纪念日的3月29日发表了8月28日・29日的这2天、正式确定会在日本的音楽圣地「日本武道馆」举办2Days的演唱会。 确定会继披头四，艾力克克莱普顿等他们敬爱的国际巨星之后站上同一个舞台这件事，让团员5人不但决心要全力以赴使这次梦想实现的演唱会成功，也决定2天的演唱会要展现充满不同魅力且惊喜满载的演出，8/28以「DO YOU EVER SHINE」命名，8/29以「抱きしめて」命名，希望可以让所有的粉丝都留下永难忘怀的感动及回忆！ 五月天5人在世界各地最常跟歌迷说的就是：「五月天的演唱会不只是五月天演唱会，还加上来到会场的每一个你们才能创造的，加入五月天，永远不会太迟！」，也提到「希望这次的日本武道馆演唱会，也可以成為与全世界歌迷一起创造传说的演唱会！」 此外，如同团员的感想中说到，这次武道馆演唱会的举办，也包含了他们在日本正式开始活动时所期待的「希望可以超越国界及语言的隔阂让亚洲融為一体」的想法。 Mayday who has hit many milestones across the international stage will take a new history-making step in Japan this summer. 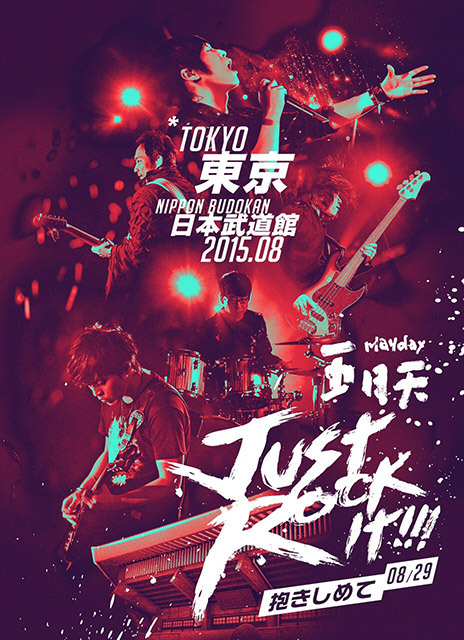 They are confirmed for a two day show on August 28 and 29 at the sacred venue of music – the Nippon Budokan. This was announced on March 29, the anniversary date of forming their band, Mayday. Mayday will be performing at the venue where all the international superstars they respect have performed such as The Beatles and Eric Clapton. 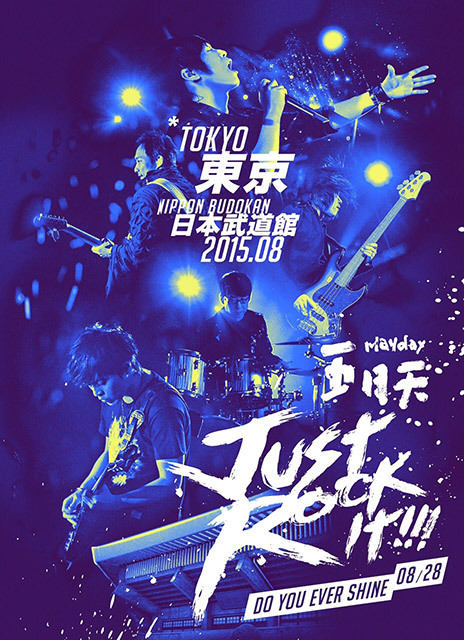 Each member of Mayday has sworn to make these concerts successful to the fullest. These two day performances will have different themes with attractions filled with surprises – the first day is ~DO YOU EVER SHINE~ and the last day is ~Dakishimete~ – they strongly hope to deliver unforgettable inspirations and memories for all the audience members. Moreover, performing at the Nippon Budokan is significant because there is an underlying meaning that they have started full-scale activities in Japan. It carries a meaning of “wishing to create one Asia beyond borders and language barriers. 세계를 무대로 수 많은 금자탑을 세워 온 아시아의 슈퍼 밴드Mayday가 이 번 여름, 일본에서 새로이 역사적 발걸음을 내딛는다. 8월28일・29일, 일본 음악의 성지「일본 부도칸」에서 2Days공연 개최가 결정되었다고, 밴드 결성 기념일인 3월 29일에 발표했다. 비틀즈, 에릭 클랩튼 등, 그들이 존경하는 세계적인 슈퍼스타가 섰던 무대에 자신들도 같은 무대에 선다는 것이 이번에 결정 되어, 멤버 5명은 예전부터 염원했던 부도칸 공연을 전력을 다해 성공시키겠다고 맹세하며, 첫날 공연은 「〜DO YOU EVER SHINE〜 」마지막날 공연은「〜抱きしめて（다키시메테）〜」라는 서브타이틀을 붙여, 2일간 다른 매력을 가진 서프라이즈가 가득한 공연으로 하여, 모든 관객에게 영원히 잊을 수 없는 감동과 추억을 남겨주고 싶다！는 강한 의지를 보여주고 있다. 또한 Mayday의 멤버 5 명은 세계 각국에서 「Mayday 콘서트는 우리 뿐만 아니라 공연장에 와주는 관객과 함께 만드는 것이기에 Mayday에 참여하는 것은 결코 늦지 않다!」라는 코멘트를 남기고, 「이번 일본 무도관 공연도 전세계 팬들과 함께 전설적인 콘서트를 만들어주고 싶다!」라고 전했다. ASHIN（阿信）【Vo.】Maydayの代表曲はもちろん、日本語で歌う楽曲も沢山用意していくから、日本の皆さんにも楽しんでもらえるコンサートになると思います。そして遠くから来てくれるファンの期待も裏切らないコンサートにして、アジア中のファンが一体になるような貴重な瞬間を生み出す事こそが、僕らにとっての一番の願いです。 阿信【Vo.】除了Mayday的代表曲目之外，當然也會演唱許多日文的歌曲，希望會是讓日本的歌迷們都開心的演唱會。不過當然也不會辜負自遠方而來的歌迷的期待。在演唱會中發生讓亞洲歌迷融為一體的瞬間，是我們最期望的事。 阿信【Vo.】除了Mayday的代表曲目之外，当然也会演唱许多日文的歌曲，希望会是让日本的歌迷们都开心的演唱会。不过当然也不会辜负自远方而来的歌迷的期待。在演唱会中发生让亚洲歌迷融為一体的瞬间，是我们最期望的事。 ASHIN [Vocal]I will prepare to sing not only popular songs of Mayday but also many others in Japanese so that this will be a show that Japanese fans can enjoy too. We also make sure not to betray expectations of fans who come from far away. Our biggest hope is to produce a precious moment where all the fans from Asia can be one. ASHIN（阿信）【Vo.】Mayday의 대표곡은 물론 일본어로 부르는 곡도 많이 준비하고 있어, 일본 여러분들에게도 즐거운 콘서트가 되리라 생각합니다. 그리고 멀리서 와주신 팬들의 기대에도 부응할 수 있는 콘서트로 하여 아시아 전체의 팬들이 하나가 되는 귀중한 순간을 만들어 내는 것이야 말로 우리에게 있어서 가장 큰 바람입니다. MONSTER（怪獸）【Gt.】親友である日本のミュージシャン達も来てくれるそうなので、この記念すべきコンサートを彼らと共に見届けて欲しいと思います。そして6月リリースのシングルに「ナインボール」が収録！これは僕が主演した映画の主題歌なんですが、この曲は阿信と共にダブルボーカルで日本語歌唱をする予定なのでニューシングルも是非楽しみにしていて下さい。 怪獸【Gt.】聽說日本的音樂人超級好朋友們也都會來，希望他們可以共同見證這場值得紀念的演唱會。而６月份發行的新單曲裡將會收錄「九號球」！這是我所主演的電影主題曲，會和阿信一起用日文演唱這首歌，希望大家也可以喜歡這首單曲。 怪兽【Gt.】听说日本的音乐人超级好朋友们也都会来，希望他们可以共同见证这场值得纪念的演唱会。而６月份发行的新单曲裡将会收录「九号球」！这是我所主演的电影主题曲，会和阿信一起用日文演唱这首歌，希望大家也可以喜欢这首单曲。 MONSTER [Guitar]My Japanese musician friends are coming to see the shows as well so I want you all to witness this memorable concert with them. And the new single that will be released in June includes Nine Ball! This is the theme song for the film I starred in and this will be sung by both Ashin and me in Japanese so we hope you like the new single. MONSTER（怪獸）【Gt.】절친인 일본 뮤지션들도 와주신다고 하여 이 특별한 콘서트를 그들과 함께 끝까지 봐주셨으면 합니다. 그리고 6월에 발매될 싱글에「나인볼」도 수록！ 이것은 제가 주연한 영화의 주제가인데 이 곡은 아신과 함께 더블 보컬로 일본어로 부를 예정이니 뉴 싱글도 기대해 주세요. *Please contact the organizer in advance if you attend in a wheelchair. *Please note that videos and images of the shows including audiences might be released to public. *Resale of tickets and admission with those tickets are prohibited. ※휠체어로 입장하실 고객분은 사전에 문의 해 주세요. ※객석을 포함 공연장의 영상,사진이 공개 될수 있으므로 양해 바랍니다. 因為申請的張數眾多，門票已經完售。感謝大家踴躍的購買。 因為申请的张数眾多，门票已经完售。感谢大家踊跃的购买。 We have reached the allotted tickets for Rakuten ticket board and they are no longer available. Thank you for contacting us. 예정된 티켓수량에 도달하여 티켓예약이 종료되었습니다. 여러분의 많은 응모 해 주셔서 감사합니다. 当落確認・入金期間についてはツアー詳細にてご確認下さいませ。 已經截止。關於抽選結果，匯款期限等情報請於Tour詳細內容部分確認。 已经截止。关於抽选结果，匯款期限等情报请於Tour详细内容部分确认。 Time limit for application expired. Please refer to the “tour details” for next procedure 접수 종료했습니다. 당첨 확인 · 입금 기간은 투어 상세내용에서 확인해 주시기 바랍니다. 상하이/베이징/홍콩 ⇔ 도쿄 왕복 투어 실시! China Airlines Website をご確認下さい。 ※自台灣出發的官方tour，請參閱China Airlines Website。 ※自台湾出发的官方tour，请参阅China Airlines Website。 *For the official travel tour from/to Taiwan, please visit China Airlines Website. ※대만 왕복의 공식 투어에 관해서는 China Airlines Website를 확인 해 주세요. 삿포로(札幌)·나고야(名古屋)·오사카(大阪)·후쿠오카(福岡) 등 출발 투어를 실시! ※申请人数未达最低限额时有可能视情况调整方案的实施。敬请见谅。 *also available for the fans from overseas. ※Please note that if we do not reach the minimum number of participants, the plan may be cancelled. ※해외에서 상기 일본 지역에 도착 후, 도쿄로 왕복 이용도 가능합니다. ※투어 개최 인원수에 못 미칠 경우 플랜의 실시를 보류할 경우가 있습니다. 미리 양해 해주시기 바랍니다. Mayday Official Site （C）AMUSE Inc. & B’in MUSIC Inc. All Rights Reserved.